Finding the perfect toy for your cerebellar hypoplasia cat can be difficult, especially if the cat’s mobility is somewhat limited. While there are a number of toys out there that you can purchase, create for free, and make into new, improved toys, sometimes it’s nice to know what other CH cats like to play with. So here’s a suggestion from Paige, who’s the pet parent to Mister Wobbles. Since he has moderate to severe cerebellar hypoplasia, it was important for her to find him a toy that he could play with while laying down. The winning option? The Bergan Turbo Track Cat Toy – with a twinkle ball, of course. What a great idea, Paige! And I love how they placed the track toy on the rug, so they toy stays in place, and so Mister Wobbles can be more comfortable and have greater traction! 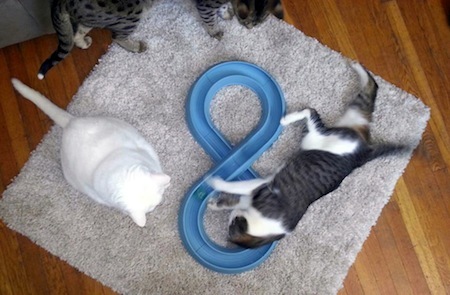 Have you found ways to modify a regular cat toy into one that meets your cat’s needs? Please share in the comments! Great idea, good job being creative and resourceful!